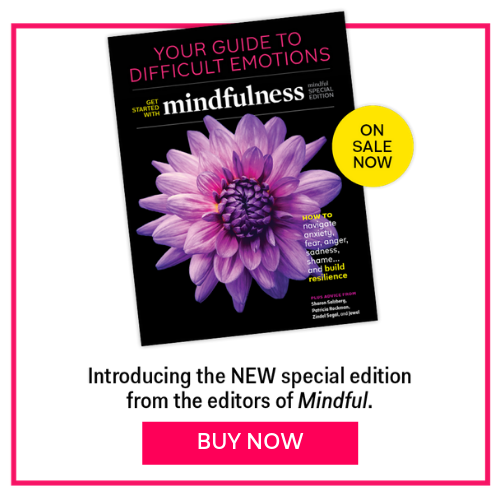 In honor of the third annual Mindfulness Day, check out these stories on meditation practice and advice from mindful.org and Mindful magazine. Mindfulness Day—September 12—was created by the not-for-profit Wisdom Publications as a way to promote mindfulness and raise awareness about its benefits. People around the world will be celebrating through workshops, meditation groups, or simply by taking a few minutes out of their days to be mindful. Here are a few stories looking at how to incorporate mindfulness into your life, from full-out practice pieces to small ways we can bring mindfulness into our lives every day. Tea Party: Looking for a respite from distraction? It's as close as a cup of tea. Jesse Jacobs from Samovar Tea Lounge takes us through a 10-minute tea practice. Walk This Way: Try these simple set of instructions for walking meditation, and keep this chart handy for practicing on-the-go. A Practice for Posture: meditation is not all in your mind. In fact, it begins and ends in the body. Meditation, Getting Started: So you want to start practicing meditation, but need to know the very basics—like how to sit. Mindfulness pioneer Jon Kabat-Zinn offers helpful tips for beginners from his new book. Why We Find it Hard To Meditate: having some setbacks? Ed and Deb Shapiro examine the most common reasons people give for not meditating and offer some helpful advice for overcoming those obstacles. The 24-Hour Mini-Mindful Challenge: What if, once an hour, you brought your life back to what is happening right now? Elisha Goldstein offers this practice. Waking up to Mindfulness: our blogger, Ed Halliwell, talks about his own experiences with getting into mindfulness meditation. He invites your comments and questions on the subject. Setting up a Mindfulness Meditation Group: Betsy Nelson on how she did it, why it helps, and how you can too.